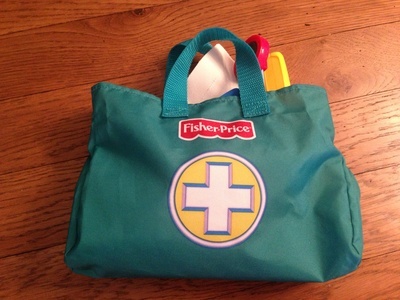 This little medical kit has brought my 3 year old so much fun and it's a great gift idea for any youngster who likes using their imagination or doing role play. Almost every day my son rushes for his medical kit to treat Fireman Sam after an accident, or Bob the Builder when he's feeling ill, and pretty much anyone who visits us gets a check up from our resident MD. The set comprises a stethoscope, blood pressure cuff, thermometeter, injection syringe, band aid and ear scope (that is used for eyes, ears, noses in our household), all of which come with a medical bag for storage. The medical aparatus is extremely easy for kids to pick up and play with, and start make believing that they are a doctor or a nurse. 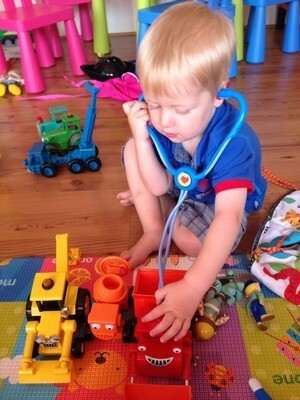 The stethoscope actually works, and kids will love speaking into sound end, to hear their voice amplified into their ears. 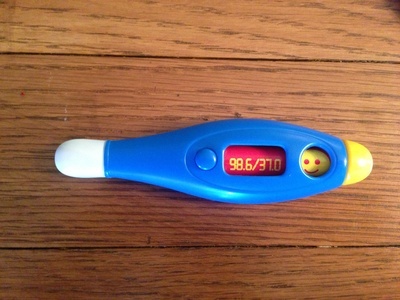 Another fun inclusion is the thermometer that gives you a happy face if the patient is well, or a sad face is the patient is ill. If you have a child wary of doctors, I would imagine you could use this kit to help them understand some of the things that a doctor might cover in their examination of your child. 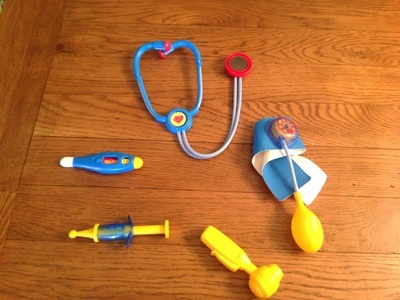 We bought the kit merely as an imagination toy for our son, but when he recently had to visit the doctors, we also realised it has enhanced his learning of what goes on with his body and what a doctor does. At one stage of his visit to the doctors, my son was asking if the doctor would like to look down his throat; something that he'd normally be especially wary of. This product is aimed at kids 3 and over, and prices vary from as little as $12 up to $40 so be price aware and look out for offers. The only negative for me, is that the kit includes a band aid that really only fits around a small child's arm. Something that would fit all ages would be preferrable as many kids will like to use their parents as patients.